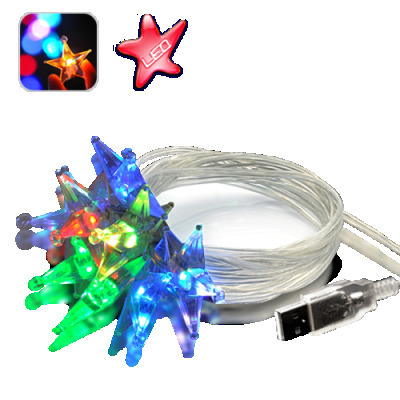 Successfully Added Crystal Sparkling Color Stars - Cool USB LED Lights to your Shopping Cart. Brighten up your home or office and add some color to your life with these beautiful USB Powered Crystal Sparkling Color Stars. Why have a plain old computer monitor or desktop plant when you can have a multi-colored wonderland? These USB powered crystal lights automatically cycle through seven bright colors to turn that boring day into a playful wonderland, even if you are stuck inside in front of your computer. Also a great way to decorate a window or attract attention for your business. All that is needed is a simple USB port to plug into and you can start making your home or office come alive in beautiful colors. Available in our warehouse now, order today and we'll express ship it out tomorrow! Brought to you by Chinavasion, the leader in LED lights and wholesale electronics.